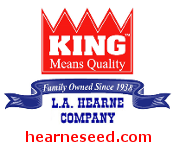 L.A. Hearne Company has been owned and managed by the same local family since 1938. ACIA is a non-profit corporation whose members are dedicated to the development and production of pure seed and who support the organization's efforts to deliver quality assurance programs that meet their needs. The California Crop Improvement Association (CCIA), a nonprofit corporation, is officially recognized as the seed certifying agency under the California Seed Law. The mission of CCIA is to provide services and support research that promotes the improvement, production, distribution and use of superior quality seeds and other agricultural products. L.A. Hearne Company sells certified organic products where they're available and we're adding new organic products to our line all the time. We take great care to assure that the certifications on our products are accurate and up to date. We have been a certified organic handler through California Certified Organic Farmers (CCOF) since July 10th, 2003.